BD75N Industrial equipment overhaul channel and metal staris special anti skid resistant coating. Mainly used in the paving of industrial equipment overhaul channel,metal stairs skid resistant coating.Especially used in the preparation of anti skid coatings on metal road surface,stair passageway etc. Two-component,packed in a plastic drum,10Kg/drum. We could offer professional customized packaging and sub-package services based on users’ requirements. 2.Curing speed is fast,with high bonding strength,the cured product is abrasion wearing resistant,high and low temperature resistant. 3.With good bonding force to for both metal and cement etc. 4.Coating has high cohesion strength,with good aging resistant performance,has flame resistance. pending-construction part,in order to protecting no needing construction part from pollution. 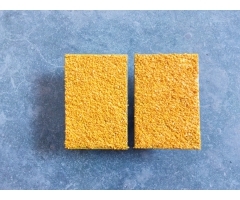 2.Clean the pending-bonding surface,make sure the pending-bonding surface be clean and dry. 3.According to the weight ratio A:B=10:1,make the B component pour into the A component,it can be put into using after mixing and stirring uniformly. hours at the temperature of 0-10 degree. 5.The mixing mass ratio of the topcoat: This product(BD75N skid resistant coating) : acetic ether=3:1,mix them uniformly. 6.Remove the adhesive tape and finish the construction. 1.Weigh the main agent and curing agent according to the specified mixing ratio,make sure to mix and stir it uniformly. 2.Please use it in time after configuring adhesive,in order to avoid causing the waste after the adhesive thickening. 3.Ethyl acetate is the thinning agent of this product. 4.The coating without curing is afraid of water,try to avoid outside construction in rainy day. 5.The skid resistant coating without curing completely is forbidden to walk. sealed storage in a cool and dry place,the storage period is 12 months. 1.Wear protective masks,protective glasses and rubber gloves. 2.Washing hands with soap before eating,drinking or smoking. with this product again.Stick to the skin accidentally by rubber material,should use the ethyl acetate to wipe it up,then flush it with clear water. Splash into the eyes accidentally,should rinse with water immediately and go to a doctor. personnel shall not do combustion disposal. construction use abrasive material),or use the non-chemical fiber fabric to cover and swat fast.